Cisco Remote Expert for Retail Banking Smart Solution Improves Customer Experience by Connecting Financial Services Advisers With Customers, "On-Demand"
SAN JOSE, CA -- (Marketwire) -- 06/20/12 -- Cisco (NASDAQ: CSCO) today announced findings from the Cisco IBSG Omnichannel Banking Study of 5,300 consumers in five developed countries (Canada, France, Germany, U.S. and U.K.) and three emerging countries (Brazil, China and Mexico). 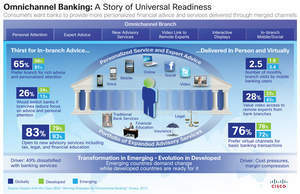 The study shows consumers want banks to deliver financial advice and banking services through both virtual and physical channels, ushering in a new era of omnichannel banking that provides customers with services in a manner most convenient and personalized to their needs. To address the omnichannel banking trend, Cisco also announced the Cisco® Remote Expert for Retail Banking Smart Solution, which helps enable virtual face-to-face meetings via high-definition video between customers and specialty lending, wealth management and other types of banking advisers -- from any bank branch, in real time. Cisco Remote Expert for Retail Banking helps enable banks to maximize the efficiency and productivity of financial services advisers so they can capture customer business at first contact, providing the personalized customer service the customer desires. Despite the popularity of virtual banking, global consumers still value bank branches for personal attention and favor expanded services that include different kinds of financial advice -- creating opportunity for the omnichannel branch. The Cisco Remote Expert for Retail Banking Smart Solution delivers a high-quality face-to-face meeting experience using Cisco's enterprise-class video and collaboration product portfolio to address the customers' desire to get more personal advice from financial service advisers (in loans, wealth management, etc.) as they walk into a bank branch. "As banks around the world evolve their business models for delivering personalized service, Cisco has expanded the Remote Expert for Retail Banking Smart Solution to focus on ease of use, scalability, and a high-touch experience. Cisco Remote Expert for Retail Banking offers an omnichannel environment where customers and financial service advisers can easily meet virtually while still maintaining the experience and efficacy of an in-person meeting." *Editor's Note: Cisco welcomes press, analysts, bloggers, and other interested parties to use and reference our Cisco research with proper attribution, such as "Source: Cisco Omnichannel Study: Winning Strategies for Omni-Channel Banking, June 2012."